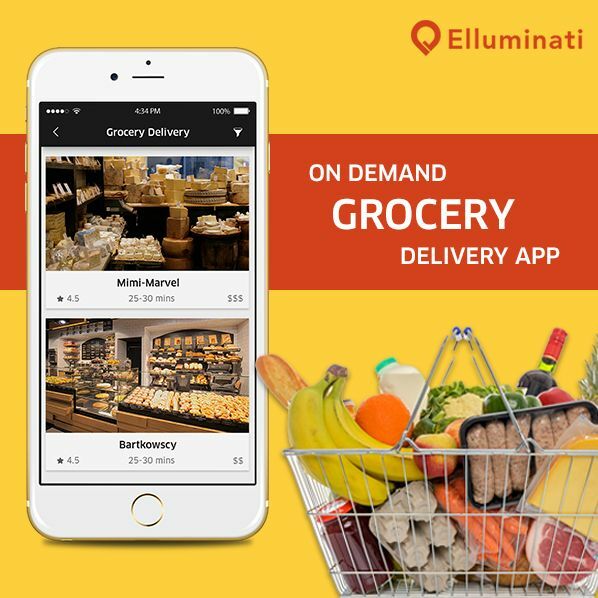 RAJKOT, India - April 16, 2018 - PRLog -- Claiming the dominance again in the territory of on-demand apps Elluminati Inc. shows tech-savvy skills with the launch of their all-new on-demand grocery app. It will be your proven helping hand when it comes to on-demand app business. One more feather in the hat of success, Elluminati Inc. added new fully featured and highly functional e-delivery app on their long list. The dedication of their work is simply reflecting in the quality of the app. A simple and sober app easy to use and attractively designed. "Grocery" when this word hits the mind, our first thought is the tiny things, mostly we forget one or two while we go to get them! In the case of this e-delivery app, you will not find a single functional or necessary thing missing in this app. Thanks to the vast experience of the company in the development of such apps. They really take such things very seriously and thus taken care of all the relevant parties. What are the offerings for all the parties? ✔ It is the app where a shopper can shop and get anything he/she wants to buy. For starting shopping with the app the shopper needs to register themselves and then after login or even do the social login to start. ✔ They can set the destination for delivery and track the orders. ✔ Shopper can choose different items from multiple stores at a time which are registered with the app. ✔ They even can put the delivery on-hold with now/later feature to get the items delivered exactly at that time when they reach home after a busy day. ✔ The customer can see the detailed information about any product and pay cash or make a cashless transaction. ✔ The delivery provider also needs to register by creating a login or can register even with any social profile. ✔ Verification is must by submitting the documents online. ✔ The delivery provider can go online/offline according to the service timings they prefer to work. ✔ Tracking facility is integrated to facilitate them to reach at the store and from there to the customer`s home. ✔ They can accept a new request and even reject it while serving other orders. ✔ Earnings can also be managed from this delivery provider app. ✔ The store can manage products, update items and many other facilities they need with such apps. ✔ They also can manage the incoming orders and dispatch orders through the app. ✔ Billing and payment statement is the heart of this app. With the help of this feature the store can generate the bills and able to manage the payments. ✔ Lastly, they can keep the history and track the orders to improve the quality of service. Since the establishment, Elluminati Inc. focuses on the quality of work and motivating the entrepreneurs with a wide range of customizable on-demand apps specially designed for small businesses, start-ups, large business chains and entrepreneurs. The central focus always remains on the need of customers which enables them to present something deliverable.